Pringle Bay, named after Rear Admiral Thomas Pringle in 1797, is famous for its rocky shores and the cave, “Drostersgat”, which was used by prisoners and runaway slaves as a hide-away in the 18th century. The cave is on private ground – it is difficult to find, in a steep inlet washed by the sea and entrance can only be gained by letting yourself down by rope between the slanting rock walls – an isolated and daunting place. A resident of nearby Onrus in the 1890’s had visited the cave at Pringle Bay and found skeletons, the remains of game and proof of fires. 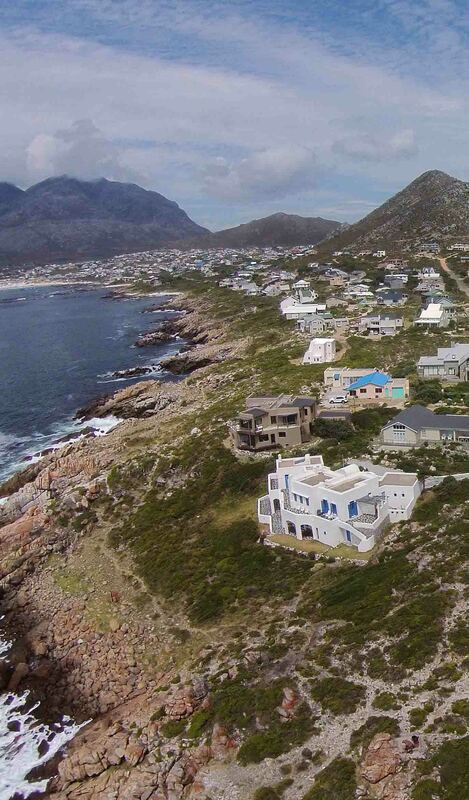 The quaint seaside village of Pringle Bay draws a diversity of individuals. It is home and hide-away to many talented artists in the theatre, film and art industry. Pringle Bay provides a safe environment for children and the ideal retirement haven for senior citizens. The mountain landscape on this eastern edge of False Bay offers some of the most spectacular scenery in the Western Cape, where the region’s complex system of folded mountains is probably better illustrated than anywhere else. The village has changed dramatically in the past few years. It’s proximity to Cape Town, linked by an excellent road and one of the most scenic drives in the world – Clarence Drive – has seen the number of permanent residents double. Substantial homes are now being built in the area and the residents’ profile has changed, alongside their needs and expectations. Bird watching in the Villa garden.The honey suckers are a delight in the fynbos. Lounge at the pool with a book or simply relax while taking in the splendor of the sea. stay to remember. Walk along the pristine beaches or invigorate yourself with a swim in the refreshing ocean. Explore the tidal pools in front of the Villa. Hiking and mountain biking, in the surrounding mountains.